WARRIORS WIN! The Golden State Warriors have won Game 7 after trailing in the series 3-1, 96-88! A historic 73-9 in the regular season, and now heading to their second straight NBA Finals against LeBron James and the Cleveland Cavaliers! Stephen Curry: 36 points, 8 assists, 5 rebounds, 3 TO, 13/24 shooting, 7/12 threes. Klay Thompson: 21 points, 6/11 threes. Everyone really needs to know this! How many gorillas are left? The move sets the stage for a clash between them and Cord supporters who also claim to have booked the facility on the same day. Speaking in Mai Mahiu Naivasha, the Jubilee denied that the prayer meeting had been cancelled in favour of the Cord meeting, terming the allegations as baseless. Flanked by Lucy Ngunjiri from Prayers Beyond Boundaries Ministries, which claim to have booked the venue, the leaders vowed to proceed with the meeting. Ngunjiri refused to address the press and instead directed them to the political leaders. Kang’ata said they did not anticipate any violence, as the meeting was meant to pray for the country. The MP added that all people are welcome. “We plan to mobilise over 100 MPs to attend this prayer rally, while the other legislators will accompany the head of state in Nakuru to mark the national day,” he said. The MP added that Cord leaders were also welcome to come and pray with them, adding that no politics would be allowed in the meeting. Nairobi county government has said Cord has the rights to hold their meeting at Uhuru Park. On Monday morning, 32 Cord and Jubilee MPs held a private meeting at Lillian Towers. The meeting calls for a 'Bipartisan Parliamentary Conclave' to discuss how best to resolve the IEBC standoff. It is led by Mukuruweni MP, Kabando wa Kabando; Ugenya MP, David Ochieng'; and Tarbaq MP Mohamed Elmi. The MPs are expected to issue a statement once the meeting concludes. Later in the day, Jubilee MPs will hold a press conference concerning the planned events on June 1. The government has banned Cord and a church fighting over Uhuru Park from hosting any meeting at the grounds on June 1. Cord had planned parallel Madaraka Day celebrations at the grounds, a move that was contested by Prayers Beyond Boundaries Ministries who claimed they had booked the same venue. Government spokesman Erick Kiraithe on Monday said the decision to ban the two rallies was arrived at by the National Security Advisory Committee after noting that the two events posed a security threat. He announced that the Nyayo National stadium was also out of bounds for any activity on Wednesday, June 1 for the same reason. “With all the factors surrounding the incidents, the NSAC regrettably noted that the two incidents had taken dangerous political dimensions and as a result, it was decided that the grounds will be sealed off to both parties for security reasons,” he said. Cord has plans to hold the meeting to mirror the celebrations that are to be led by President Uhuru Kenyatta at Afraha Stadium in Nakuru on the same day. Uhuru Park had also been booked by the Prayers Beyond Boundaries Ministries for a three day prayer meeting that was to end on June 2. Both parties had claimed to have a green light from the Nairobi County Government to hold their functions at the contested venue, but the county insists Cord has the permit. Somewhere between a discussion about whether or not blind people should be allowed to drive cars and a striptease by a hefty bearded man hoping to be elected party chairman, the Libertarian Party selected its presidential and vice presidential candidates for the 2016 election cycle. And, strange as it may seem, it could have a real impact on the results of the general election in November. Meeting in Orlando, Florida, the Libertarians selected former New Mexico governor Gary Johnson and former Massachusetts governor William Weld as their presidential and vice presidential nominees, respectively. While neither is what you would call a political firebrand, both have served as the chief executive of a state, and that makes the Libertarian ticket a far more credible alternative to voters disillusioned with the two-party system than it has ever been in the past. This is not to say that a Johnson-Weld ticket has any chance at all of winning the White House. At the moment, among the combined members of the House and Senate, state governors and members of state senates and the lower houses of state legislatures, the number of Libertarians currently holding elected office is: 1. That’s .0001 percent of available elected positions in the country. However, in the 2012 election, when Johnson topped the ticket with former Orange County, California, Superior Court Judge Jim Gray, the Libertarians took one percent of the national presidential vote. While that sounds trivial, in an election year when the Republican Party faces huge demographic obstacles, a full percentage point is a giant worry. And in a year when the party’s nominee is all but certain to be Donald Trump, a marginally credible Libertarian ticket is an absolute nightmare. The area of overlap between the GOP and Libertarians is, generally, the leave-us-alone constituency, which prefers the least intrusive version of the federal government possible. Trump -- with promises of a federal deportation force, maintenance and even expansion of the social safety net, and religious tests for immigration -- is anathema to many in that group. For months, Republicans personally opposed to Trump have been actively, and sometimes very publicly, seeking a plausible alternative to the New York billionaire. So far, no plausible third-party candidate has emerged, and that’s great news for Johnson and Weld, who could well emerge as a safe harbor for small-government conservatives who can’t bring themselves to vote for Trump. That’s not to say the conversion will be easy. The Libertarian convention had plenty of the moments of absurdity that, over the years, have relegated the party to the fringe in the past. Johnson, at one point, was booed for suggesting that the government has an interest in licensing people to drive motor vehicles. At one point, there was actually a discussion of whether or not blind people ought to be barred from driving. Late on Sunday, a candidate for party chairman demonstrated his commitment to transparency by performing a strip-tease on stage. In the end, though, the party nominated what is probably its most qualified ticket ever, at least in terms of real experience in government. And for the #NeverTrump element of the Republican Party, that might be just enough to justify voting for them. And for Trump, whose path to the White House, while real, is very narrow, that’s bad news. Whenever the moment is biggest, Andre Iguodala rises to the challenge. Longing, rusted, furnace, daybreak, seventeen, benign, nine, homecoming, one, freight car. And just like that, Andre Iguodala is activated and ready for the next mission. There's no need for him in the regular season. Sure, he's a great sixth man and his skills are often apparent, but the general insignificance of most of the 82 games in a regular season makes it hard to isolate and appreciate his impact. He's a good player and an even better defender, but above all, he's a weapon to unleash only in the most critical moments. For it is in those isolated snapshots, when narratives are forming and dying at high speeds, that Iguodala makes his greatest mark. 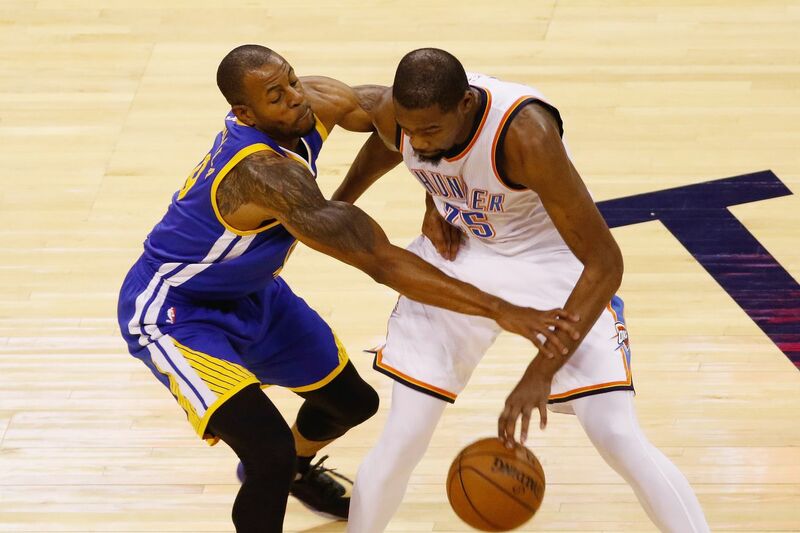 Game 6's assignment was to stop Kevin Durant, one of the top three best players in the NBA. A successful mission was essential. Without it, the winningest team in the history of basketball would go home empty-handed. This is where you notice just how deadly Iguodala is. A task such as this would rightfully burden most players, not only because of the occasion, but also the skills needed to accomplish it. Yet this is when Iguodala thrives. He lives for these types of situations. It's not much different than a year ago, when he was crowned NBA Finals MVP. The Warriors tried everything to stop LeBron James. When they double-teamed, James exploited them with his intelligent passing, creating opportunities for his teammates while still somehow managing to get his own points. When they dared him to beat them by himself, he responded by damn near doing so. It was only when the Warriors inserted Iguodala into the starting lineup to have him shadow James the entire game that the Warriors triumphed. Iguodala didn't stop James completely. No one can. Nevertheless, Iguodala made James work hard for his points and exhausted the former MVP, all while aiding the Warriors with timely offensive contributions. Starting him proved to be the catalyst in the Warriors' six-game victory. The Warriors were in an even more dire spot against the Thunder, and Iguodala was again the perfect man to stop in. Klay Thompson and Stephen Curry were the stars again, as offensive players tend to be. Thompson especially was in his human torch mode and will need to be extinguished with the same care and ferocity needed for California wildfires. But even with the two ironically-named Splash Brothers on fire, Oklahoma City still had a legitimate shot at beating the Warriors. After all, the Warriors were down for most of the contest. It was Iguodala who extinguished those hopes. Once again, he was inserted into the starting lineup after halftime. Once again, it was his defensive effort that assured the win for Golden State. With the score tied at 101 after an Iguodala layup, Russell Westbrook stormed down the court to try to drag his team forward. But before he could even think, much less do, Iguodala swiped the ball from him before making the pass to Thompson for the go-ahead three. On the next possession, Kevin Durant try to do what Westbrook couldn't. He forced a three-point response to Thompson, except with Iguodala smothering him, it came up short. Iguodala showed up far before those two minutes, too. As he did to LeBron, Iguodala made life a living hell for Durant. In one instance, he closely guarded Durant on the right block when Durant took one dribble to the right and tried to shoot. Before Durant even jumped, Iguodala smacked the ball from his hands. As Durant hung in the air empty-handed, Iguodala dove to try to save the loose ball. While he didn't corral it, his effort created a shorter shot clock that resulted in another Thunder miss. That wasn't a steal, block, offensive foul or any play easily measure in the box score, but it was quintessential Iguodala. He specializes in those defensive disruptions. To put it simply: He makes it extremely hard for the world's best basketball players to play basketball. Frustrating is the best word to describe him. He's fast and strong, with a very quick mind and even quicker hands. While he matches most opponents with his strength and athleticism, it's his intelligence that allows him to guard anyone without making silly mistakes or drawing fouls. He's malleable, too: Golden State gets to deploy him from the bench or bring him into the starting lineup when they start to suffer. He's the proverbial wrench that ruins opponents' best plans. Such a player is only at his best when he can cruise through the regular season. Iguodala must wait, encased in ice, while the rest of his teammates fend off the challengers before the playoffs. That's not his time. Those moments are much too small for him. Facing elimination in a loud, hostile environment? That's his time. Those are his moments. That is when he turns the screws on the opponent's best player, denying them any decent opportunities until the game's been decided. In these situations, he's not flashy like Steph or Klay, but he's just as critical. And absolutely unfair, if you're the player trying to score on him.